It’s only fitting that NACUBO announced the retirement of Anne Gross, vice president, regulatory affairs, at the Student Financial Services Conference, in early March. It was Anne, retiring in late April, who envisioned SFS more than a decade ago. To launch that ambitious effort, she created the Student Financial Services Council, and later, shepherded the SFS Benchmarking study and the SFS Policy and Procedure study from their inception. First working for NACUBO as a consultant for a federal affairs project, in 1986, Anne later officially joined the staff in 1988. 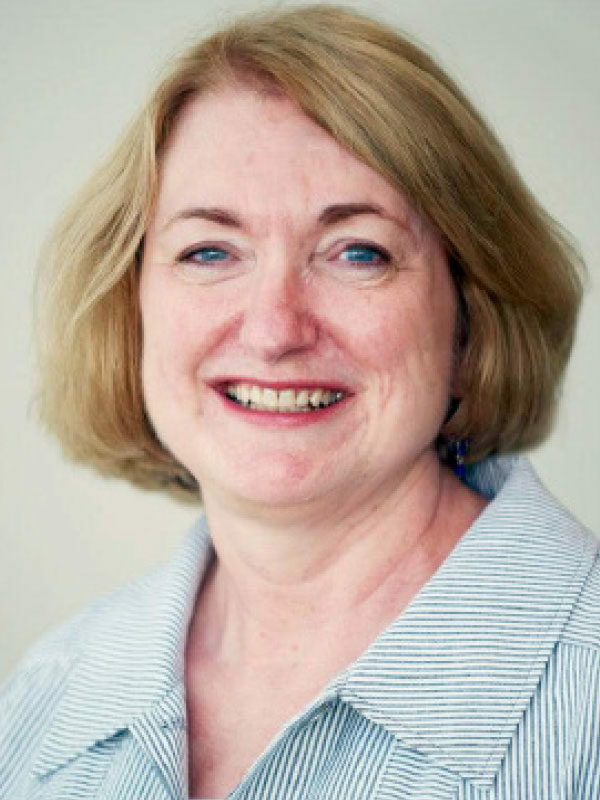 For more than 30 years, Anne has contributed to the association’s valuable work—developing webcasts, news stories, advisory reports, and Business Officer magazine articles. She has also represented NACUBO’s membership behind the scenes. Her humility belies the respect that she has earned from our colleagues at other national higher education associations, in her interactions with Capitol Hill, with corporate partners, and—most importantly—at the U.S. Department of Education. Please join all of us at NACUBO in congratulating Anne Gross for her countless contributions to the work of your national association over the course of her remarkable career. Preceding the 2018 NACUBO Planning and Budgeting Forum, in Louisville, Ky., NACUBO and APPA will launch a new workshop designed to help finance and facilities decision makers advance their campus operations. The one-day program—Finance and Facilities Leadership Workshop—will be held on September 23, at the Omni Louisville Hotel. As finance and facilities leaders face ongoing challenges, they often do not take advantage of the opportunities that could prove effective to advance their institutional missions. In an age of acceleration—changing funding models, technology advancements, shifting workforce demographics, strategic stewardship, and master planning—decision makers will need increased awareness to meet strategic goals and initiatives. Enhance alignment of facilities asset reinvestments with institutional strategic plans and business goals. Articulate and communicate the value of the facilities portfolio. Redefine and align the facilities organization role in mitigating institutional risk. Understand the Total Cost of Ownership framework. Strategize to improve facilities for program delivery, energy efficiencies, and more sustainable operations. The Higher Education Accounting Forum (HEAF), to be held from April 15 to 17 in Kansas City, will host advanced-level accounting and finance professionals in sessions offering the latest information on trends and best practices in financial accounting and reporting, managerial analysis, and leadership issues for all institution types. Topics include auditing, revenue recognition, public-private partnerships, financial responsibility, and more. With several sessions streaming in real time, the NACUBO Live! component will offer members the opportunity to participate from their campuses, including the ability to ask questions and earn CPE credits. Lessen the Confusion About Higher Education Accounting and Auditing. In addition to the live-streaming presentations, bonus sessions will be recorded and available at the completion of the workshop in Kansas City. For more information and to register, visit the E-Learning page on www.nacubo.org. David R. Glezerman, assistant vice president and bursar, Temple University, Philadelphia, was recently awarded the Student Financial Services Award, during the NACUBO Student Financial Services conference in Orlando. Employed at Temple since 1986, he is responsible for more than $400 million annually in student loans and accounts receivables. He has worked in accounts receivable management for 39 years, with experience in higher education receivables management for 35 years. In addition to his work in student financial services, he co-authored with Dennis DeSantis Managing and Collecting Student Accounts and Loans: A Desk Reference for Educational Receivables Stewardship (NACUBO, 2016), and has written several articles about higher education receivables. 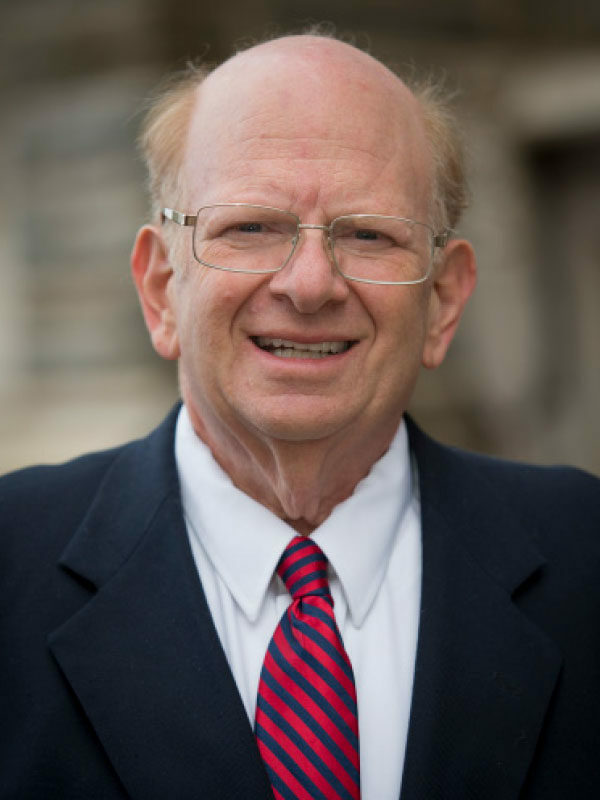 A co-creator of the higher education collection specialist certificate program and certified instructor for ACA International, the association of credit and collections professionals, Glezerman is a past recipient of ACA’s Member of the Year and Charles F. Lindemann Instructor of the Year awards, and was designated by ACA in 2009, as a master credit executive. Glezerman also is an active member on ACA’s creditors international committee and, for five years, chaired the association’s Government Services Program committee. As a speaker, Glezerman has presented at many industry conferences and workshops, and has worked with NACUBO as a faculty and program committee member for various meetings. In 2010, Glezerman was honored by NACUBO with the Professional Development Award and was a founding member and chair of the organization’s Student Financial Services Council. Glezerman was a member of the Coalition of Higher Education Assistance Organizations, where he served from 1995–99 on the Perkins Loan Task Force steering committee. In 1999, he was awarded the COHEAO Member of the Year award. He also is co-founder of the Educational Accounts Receivable Management Association, designed for institutional debt collection personnel in eastern Pennsylvania, New Jersey, and Delaware. Featuring a streamlined and easy-to-navigate layout, the new NACUBO website allows visitors to have a more dynamic and engaging experience. At the office or on the go, members stay up-to-date on higher education news on their computer, smartphone, or tablet. Enhanced features include a new home page, improved navigation, and a robust search function. Easily accessible information on NACUBO workshops and e-learning. The latest news headlines impacting the business office. A NACUBO Spotlight that puts member institutions front and center. Videos featuring member experiences, conference highlights, and more. In the coming months, the site will allow members to manage the way they’d like to receive NACUBO communication, and provide an online portal by which nonmembers may join NACUBO. We welcome your feedback; send comments to sdallas@nacubo.org. 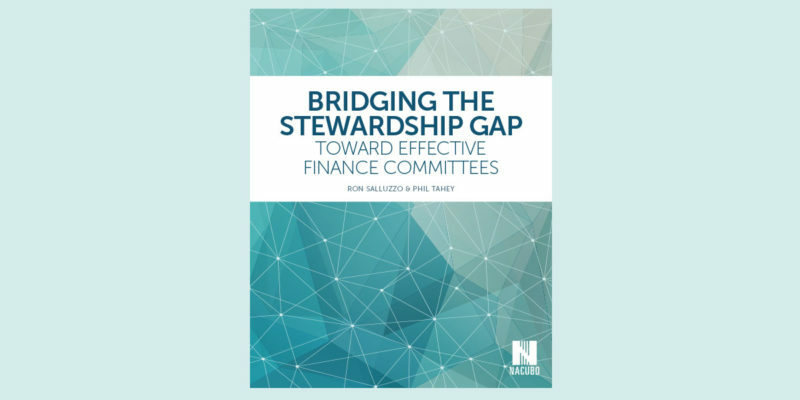 NACUBO’s upcoming publication, Bridging the Stewardship Gap: Toward Effective Finance Committees, by co-authors Ronald Salluzzo and Phil Tahey, will offer institutional leaders—who need support in better understanding the business model of colleges and universities—guidance on how to effectively communicate to members of their board and finance committees. The authors’ collective knowledge is based on more than 80 years of combined experience in governance practices related to financial matters for colleges and universities. Reviewed by experts and chief business officers in the higher education sector, this publication offers a deep dive into understanding institutional finances and strategies. The book’s primary audiences are at institutions that fall within the baccalaureate and master’s Carnegie classification levels and serve fewer than 10,000 undergraduate students, with the clear majority serving fewer than 4,000 undergraduates. The institutions in this category are often struggling financially, and increasingly require effective oversight and governance by their board of trustees, especially their finance committees. Scheduled to be released in May, the book will be available in print, electronic, and audiobook formats. The authors will also be presenting at the Higher Education and Accounting Forum, to be held April 15–17, at the Kansas City Marriott Downtown hotel.